(CBS News) New research finds a simple modification may make a cancer drug three times more powerful without the side effects a higher dose would likely cause. All it takes is a glass of grapefruit juice. In the preliminary study published in the August issue of Clinical Cancer Research, scientists at the University of Chicago set out to analyze how certain foods would affect metabolism of the anti-cancer drug called sirolimus, which is an FDA-approved drug to prevent rejection of a kidney transplant and has been seen to help some people with cancer. The problem with sirolimus, however, is that the drug is easily metabolized and leaves the blood stream before it can show benefits. The optimal dose needed to show anti-tumor benefits also brings with it significant gastrointestinal problems. "Grapefruit juice, and drugs with a similar mechanism, can significantly increase blood levels of many drugs, but this has long been considered an overdose hazard," study director Dr. Ezra Cohen, a cancer specialist at the University of Chicago Medicine, said in a news release. "Instead, we wanted to see if grapefruit juice can be used in a controlled fashion to increase the availability and efficacy of sirolimus." The researchers enrolled 138 patients with incurable cancers in early stage trials in which they were given sirolimus either alone, with an eight-ounce glass of grapefruit juice or with a drug called ketoconazole, which slows drug metabolism. Patients started with low doses of sirolimus at first and increased them as the study went on to see how much of the drug would cause the best anti-cancer benefits with the least amount of side effects. The researchers found that the most optimal dose was 90 milligrams of sirolimus per week. However nausea and diarrhea would occur in people taking 45 milligrams per week, requiring subjects in the sirolimus-only group to cut their dosage. 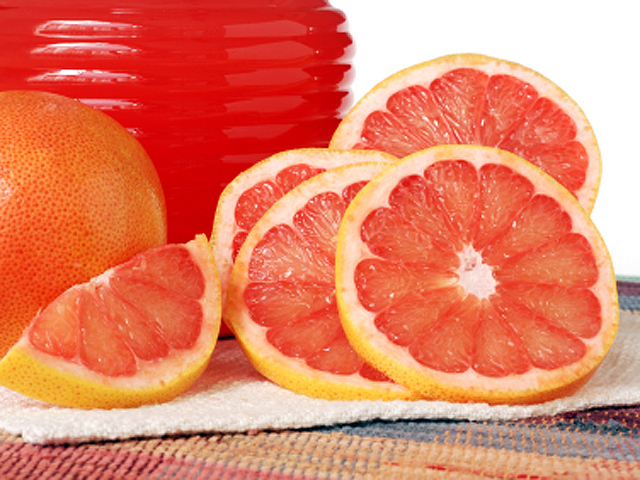 For the other two groups, the amount of sirolimus needed to reach cancer-fighting levels in the blood was significantly lower: Those taking sirolimus with grapefruit juice needed between 25 and 35 milligrams of sirolimus per week. That suggests a 350 percent increase in drug levels, fueled by grapefruit juice. Those taking the drug with the ketoconazole only needed 16 milligrams of sirolimus to reach treatment levels - a 500 percent increase in drug levels. "This is the first cancer study to harness this drug-food interaction," the authors wrote. They explain that grapefruit juice prevents enzymes in the intestines from breaking down the drug within a few hours, and the effect gradually wears off over a few days. The researchers say grapefruit juice is non-toxic and has no risk of overdose which makes it an attractive option over ketoconazole. As for sirolimus' cancer-fighting effects, no patients in the study had a complete response but 30 percent of the patients' cancers did not advance. One of the patients had a partial response, shrinking the tumor, which lasted for three years. Dr. Jerry Avorn, chief of the pharmacoepidemiology and pharmacoeconomics at Brigham and Women's Hospital in Boston, who was not involved in the study, told ABC News that grapefruit juice may save patients money on their treatments. "The cost of cancer treatments are very problematic for a lot of patients," he said. "If this were to pan out in subsequent studies, this could really be a boon in terms of affordability of these drugs."